Not quite Japan, but a sea apart. Meet Dr. Sheng. You may think Dr. Sheng is just doing this as a publicity stunt for the 2008 Beijing Olympic Games. You would be right. However, this is not the first time Dr. Sheng has stuck needles in his head for a publicity stunt. 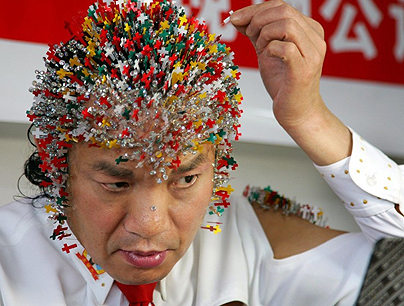 In 2004, he actually secured a spot in the Guinness Book of World Records after piercing 1790 needles into his head. You have to assume he is an acupuncturist. However for this stunt, Dr. Sheng pierced needles in his head, face, hands, and chest. This year’s Olympic games has gotten quite a bit of publicity leading up to the opening ceremony for sure. Via Telegraph.